What's New About This? they looked the same! It has a big difference! This is the accurate and improvised version of what i made, i decreased some freeboard and draft/draught size and there are Big difference as you can see, increased the overall legnth into 300m, while it's waterline is 294m in scheme B/2. The most biggest,strongest, and the first preliminary battleship of Yamato. This battleship could've dominated the pacific if it became a reality, but it didn't, she was the First A-140 or yamato's preliminary. what makes this ship unsinkable(even though its not) is giving it an american Radars and AAs. Later update, i will try the Scheme D/4 with the practical 19in/sixth year type. May I use your Yamato in my universe? If you love or something that should be criticized in my universe. Don't hesitate to leave your comment. That one is too old. So, you'd better follow this one. Yes, you can as you wish. 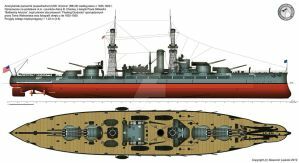 So you taken Fujimoto's last battleship proposal (Aka Fujimoto's dream battleship) altered it and put older weaponry on it: 46cm/50 Type 6 (1917) instead of the Yamato's 46cm/45 Type 94 (1934) cannons? the 18.9" sixth year type gun? i might have made one but it made it larger than yamato's turret. i am replacing the 18.1" with 18.9" in Scheme D/4. Sry but i rushed it! I will make the twin and n13 style and its alternatives. I believe i made the a140 style turret. I suppose these are all weird and odd designs but i will take it. Not necessary, they were designed to fit in the Washington Naval Treaty Limits and would had been built if the first London Naval Treaty would not extend the battleship building holiday. They are maximum on minimum design meaning the best armour and armament on the smallest hull possible. The limits of all sizes and weight. I just finished making this.